Through this blog, we shall be sharing with you an exclusive list of some of the Top Business Schools in India or as we commonly say Top B-Schools in India. So, if you are looking for the Best Business Schools or B-schools in India, your search probably ends here. After reading this, you will get to know about the Top 10 B-Schools in India plus a few more to add upon to the list of best business schools in India. “Business Schools” as the name implies are the educational institutions that offer a range of business programs, courses or degrees to choose from. A business school might offer a whole set of management programs, but they are primarily known for the MBA programs or Master of Business Administration Programs. Every year thousands of students get into the race of pursuing specialised management courses. This applies especially to the MBA aspirants who want to grab an opportunity in one of the top business schools in India. Getting into the top B-schools is not an easy task, only few lucky ones out of the whole lot make it to the top. Business Schools in India: Which one to choose? There are a huge number of Business Schools spread across the country. Which one you are eligible for? Which Business school should you apply and if selected which should you join? These are the questions that worry students time and again. Simply stating, its a tough choice to make when it comes to selecting the right educational institution for yourself. There are various crucial factors that need to be considered while making the perfect choice. Your Ability: This includes your academic performance as well as your aptitude. Your Entrance Score: The cut-off percentile of the institution and your actual score are the key indicators. Your background: Academic as well as financial background matters here. You need to spend a considerable amount of money while studying in the Top business schools. So, fee structure also plays an important role here. However,once you get through the placement drive after completing your course, the salary figures shall itself reflect the quality of returns you get. Your career objectives: What you actually want to achieve in the long term by joining the best B-School? and What are your career dreams that you want to fulfil in the long run? These factors surely help in deciding the best business school for yourself. Once you have an answer to the above queries, you can well analyse where you presently stand. You know in which direction you want to move ahead for building a successful career base. The individual choice may vary from person to person based on his own requirements. You may also like to have a look at : Best Distance Education University in India ! No doubt, the placements and the high salary packages that are offered to the Top B-school students are too attractive. In fact, these play a pivotal role and attract students from all over. However, salary should not be the sole criteria. The various opportunities, advantages, individual growth and top managerial roles that one gets to perform after pursuing a course from these top B-schools is also of prime importance. Here, we have compiled an exclusive list of some of the Top Business Schools for you to checkout. Read through to lay the foundation stone for a great career ahead. The ranking may slightly differ based on different criteria taken for this purpose. We have covered some of the popular names that rank as India’s Top B-Schools. This was our list of some of the top Business Schools in India. Did we miss out any important name here? If you have any other top business school to add to the list above, do share in the comment section below. Feel free to share your valuable feedback and any opinions thereon. 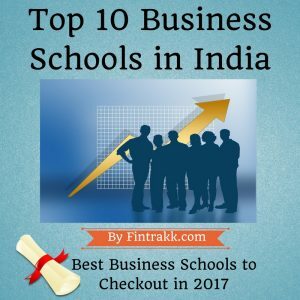 https://fintrakk.com/top-10-b-schools-in-india-best-business-schools-to-checkout/Top 10 B Schools in India : Best Business Schools to checkout in 2017https://fintrakk.com/wp-content/uploads/2017/03/Business-Schools-in-India-e1489059372422.jpghttps://fintrakk.com/wp-content/uploads/2017/03/Business-Schools-in-India-150x150.jpg 2019-01-01T02:04:26+00:00 adminCareerb schools,b schools in india,best business schools in india,business schools,business schools in india,top 10 B schools,top 10 business schools in India,top b schools,top business schools,top business schools in IndiaThrough this blog, we shall be sharing with you an exclusive list of some of the Top Business Schools in India or as we commonly say Top B-Schools in India. So, if you are looking for the Best Business Schools or B-schools in India, your search probably ends here. Thanks for sharing this important list. I am studying XII Commerce Group. I would like to study Undergraduate courses related to business line. Kindly advice. 1. They shall provide inter-disciplinary education. 2. They shall have an amazing concept of passion programs in which you can continue your hobbies with studies . 3. You will gain skill-sets that you need for an international career in accounting with top MNCs. 4. Faculties are very keen on covering the topics with the curriculum that meet National as well as International market. 5. There will be a number of career opportunities for students. The best part is that some of the degree courses are open to students of all the streams: Commerce, Science or Arts. Really nice article giving all relevant details. Thanks for sharing. Hi, I am from (M.P. )studying in 12th commerce and I am so confused about my future that which field should I choose after my 12th class. I don’t know what to do. I m quite interested in Accounting and Business Studies. Please let me know what can I do after passing 12th class. There are many career opportunities which you can opt after 12th standard. I’ve listed job oriented courses here. Hope this list will be of much use to you. There are a number of institutes which offer many courses with specialization in many different disciplines.There are many disciplines students can choose from as per their interest. However, all the courses are designed with curriculum to meet the requirements of the corporate world nationally and internationally. You can also include ISB or Indian School of Business here. Hello, I am confused which course to do to join a business or management college. Kindly give me some suggestions. Which private university is the best in Uttarakhand area? Any idea about it. Be a part of our active & growing community!